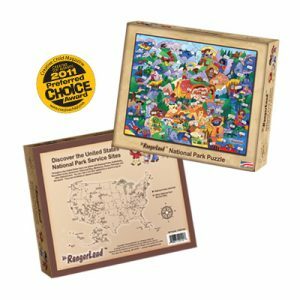 This colorful puzzle features the U.S. national parks and shows many of the fun activities available there. The box back includes an interpretive map showing all of the National Park Service sites. Inside the box is an insert which informs families about the Junior Ranger Program available at National Park Sites. Creative Child Magazine 2011 Preferred Choice Award recipient. 24×18 inches, 48 large pieces. Made in the USA.